Three year starter on a team that won 3 WPIAL Titles. Played in two PIAA state Title games, winning one State Championships. 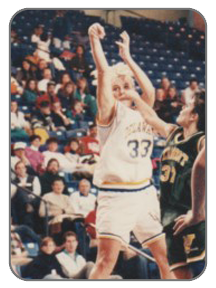 The team won 56 straight games and garnered a #11 national ranking her senior season. Three – year All-State selection scoring 1,876 points to set a new all-time scoring record and set the game scoring record with 43 points. North Fab Five selection junior and senior year and Player of the Year her senior season. At Delaware, won two Conference Championship, three – year starter and leading scorer, captain and All-Conference honoree her Senior year. Also a 1,000 point scorer. made three PIAA finals, winning the State Title in 2016. Her career record is 378-126. Molly was the Post Gazette “Coach of the Year” in 2003 and the PIAA “Coach of the Year” in 2016.